There are two bright comets visible in my sky above western Wisconsin right now: Comet C/2012 S1 ISON, and Comet C/2013 R1 Lovejoy. I got to see both of them very early this morning, and that was great, but I also tried to get images of both. Comet ISON is the brighter of the two, but it didn’t rise high enough to even see until after 5:00 am. The sky starts to get light from the coming sunrise by 5:30, so my attempts were just too washed out to bother with. ISON will whip around the sun on Thanksgiving day, and if it isn’t destroyed, it could be amazingly bright in the first couple of weeks of December. I’ll try again then. But here’s Lovejoy. It was high, bright, and easy to find in binoculars, though washed out itself by the gibbous moon. I took 15 ‘light frames’ (ordinary shots) and 15 ‘dark frames’ (shots taken with the lens cap on), 25 seconds each (anything more and the moon got them). Then I combined them in a program called DeepSkyStacker. It takes these images and combines the ‘lights’ (smoothing noise and improving signal), and then removes hot pixels and other artifacts from the image that show up in the ‘darks’. I took the resulting image (I don’t quite understand why, but they are always quite dark) and ‘stretched’ it in Photoshop. Taken with my Canon T1i and Nikon 180 mm ED lens. I was happy that everything worked so well and quickly; I haven’t imaged in a while. My Vixen Super Polaris equatorial mount tracked beautifully, and my rough polar alignment (using the polar scope) happened to be very close, even though the reticle (the little pisture showing where to put the North Star) is quite old and outdated. I was able to quickly line up my 5-inch Maksutov telescope, it’s finder, and the piggy-backed DSLR. I was also able to find my targets quickly just by eyeball aligning. I didn’t drop anything or trip over cables. Yay me! This after getting little sleep for the last few nights, getting up at 3:00 with hopes of clearing skies. I’m no expert on processing. This was done with DeepSkyStacker and Photoshop CS2. It’s an uncropped image. I know DSS does things linearly, and you’re supposed to ‘stretch’ images elsewhere, but they are so dark that I feel like I cannot get as much out of them as was in the original images. Again, I probably just don’t know what I’m doing. Actually, I do know: I’m going to bed! Comet Lovejoy. 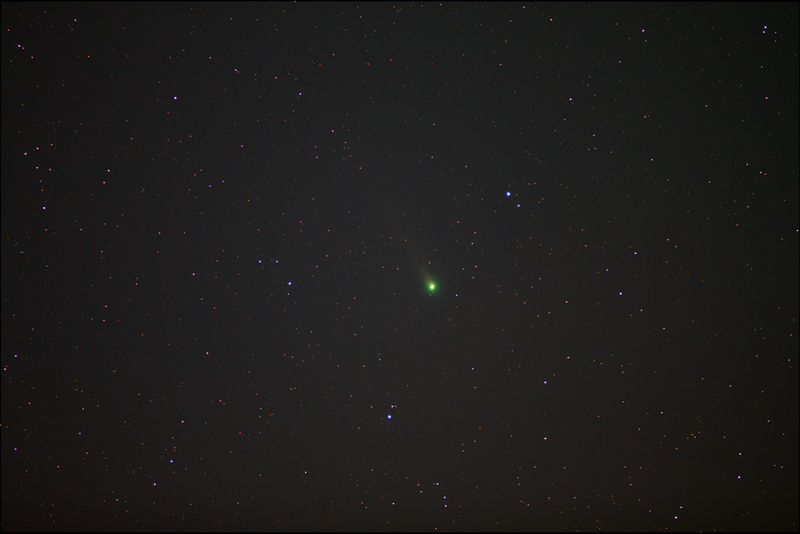 The green color, not common in astro-objects, is one reason I wanted to get an image. They’re usually more blue-green than this. It’s probably my abilities as an imager (or lack of them) that caused this, and not an actual color difference in this comet. Click on the image to see a larger version.